I'm sure my dad is going to have something to say about this post, but I found some interesting statistics while looking for something else this week. I was poking around, looking for county level statistics to create a Washington level "general happiness index." I wasn't planning on tracking it across time, just finding some quick list of the happiest of the counties. What's going on here is while reported crimes grew at a slow rate between the early 1990 to a few years ago, the total number of criminal sentences by our county courts went way up. What explains this? Stiffer mandatory sentences? This phenomena may have led to courts imposing stiffer criminal penalties over the last 20 years. 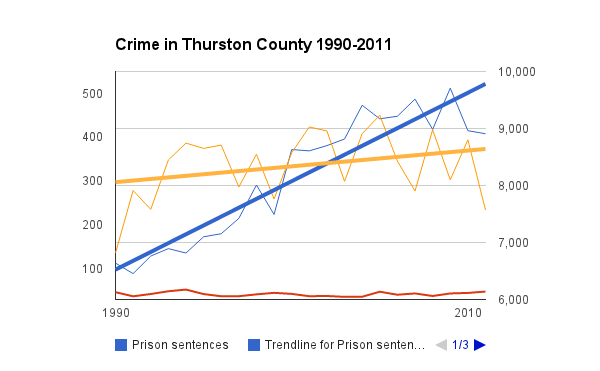 It would be interesting to plot total number of crimes reported as a percentage of population in Thurston County during that time period, too. Then you'd be able to see if the number of crimes reported increased as a result of population growth, or if the percentage decreased relative to population. There might be an interesting story in those numbers, too. Emmett, there are a couple of things I would look at - first, I would add the felony jail stats to the prison sentences - they change over time in an inverse relationship of sorts and could explain some of the change in the latter. I would also look at how well the trendlines really fit the data - the correlations look weak...too weak to draw inferences. calmer than they would be. But the real picutre is a little fuzzy. then it is unclear... hidden behind the slower growth in total crime may be a increase serious crime. That is something to be worried about. 2. If a greater percentage of convicted persons are going to prison or jail... it is probalby due to ranked order shown next. 3. Here heroin is the news. It has creeped deeply into the white middle class so the response is very different. The press and interest groups are asking for more $ for treatment programs instead of get tough enforcement.